Let me start off this review by saying this: If you are thinking about picking up one of these roll cages, stop reading now, go to your local hobby store and pick one up, it�s awesome! Ok, for those that are still with us, and not trying to find their car keys, lets talk about the cage. When I got mine, I was a bit confused. It comes in this thin box, about 1/10th the size box you would expect it to come in. We�ll, unlike many roll cages, this needs the �some assembly required� sticker. Don�t panic! It�s a pretty easy build. It probably took me just a over an hour to toss together while being distracted by some late night TV. (Don�t forget your lock-tite, your going to need it.) After a little patience, and some slight of hand, I had the roll cage on my truck. Wow! 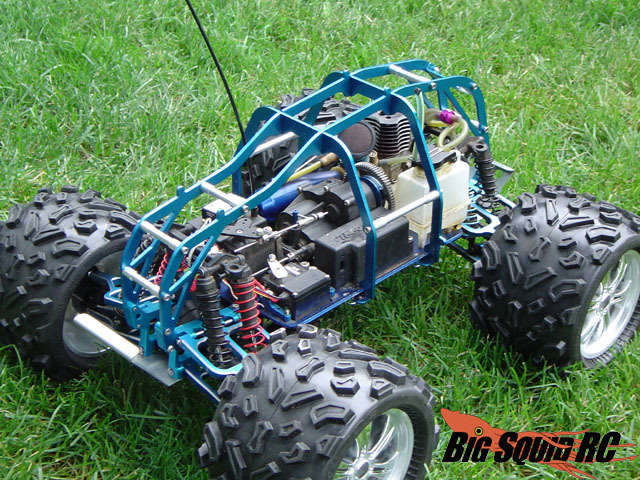 This is by far the coolest looking roll cage you can add to your truck! It just has this look about it like "I�m ready for battle! Bring it on!" Not to mention it�s shiny. We like shiny! Once that was on, I moved onto the new skid plates. These things rock! They are very firm, yet spring right back into shape! Normally, when I come home from a hard day of bashing, the first repair I need to make, is taking off my old aluminum skids, and bending them back into what kinda resembles a skid plate. Not with these! They can really take the abuse, not to mention the fact that they do a great job of absorbing some of the impact. The roll cage really is beyond sturdy. 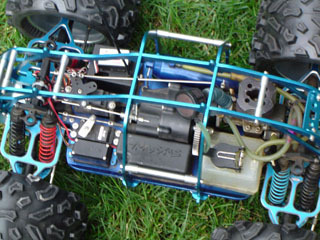 I have a habit of landing on my lid while trying big jumps, and the cage really protects everything under the hood. (Especially for parking lot bashing) I also got the cover that protects the undercarriage of the truck. 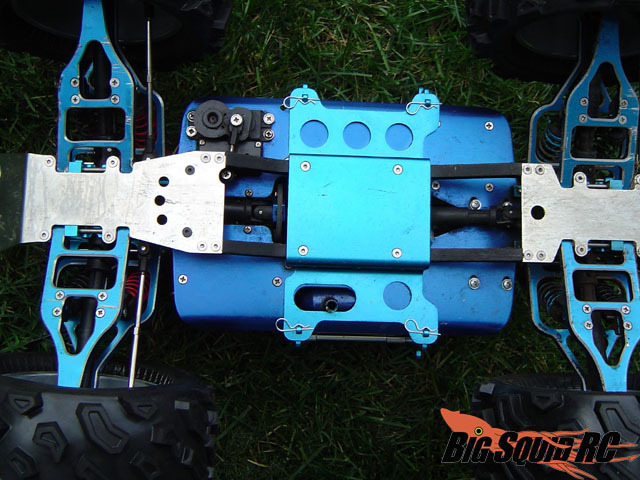 When you bash hard, you'll be surprised by all the crazy stuff you land on, and this thing does a great job of protecting the underside. The cage is also great protection for when your friends decide to play dog pile on your truck. The cage has stood up to everything I have tossed at it, and I expect it will hold up to whatever we do next. There are only two small concerns with the roll cage. The first one being weight. 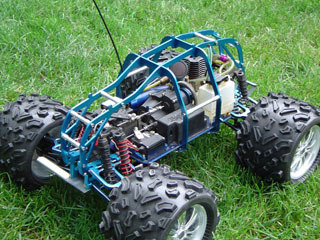 The cage is very light, but when your running monster trucks, even a little weight can make you top-heavy pretty fast. The second being, my glow-igniter barely reaches the plug with the roll cage in the way. 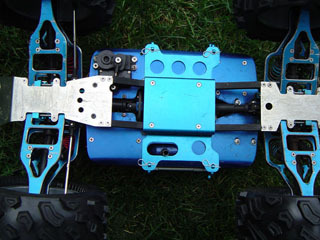 The engine in my T-Maxx sits just off center enough to make it a tough reach, but it does reach. 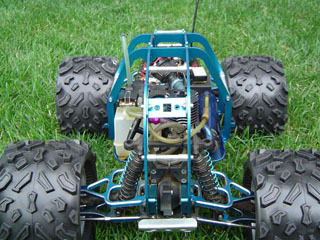 This would be no problem if I had the Traxxas EZ-start system. They even have a place to mount it! Should either of these stop you from getting one? No way! You can easily add a starter cable to your glow plug and mount it somewhere with a little better access, and being a little top heavy just makes me work on my cornering more. Well, to wrap it up, I love this stuff! For anyone in the market to get a roll cage, or maybe just a small upgrade to some better skids, RC Solutions has the stuff for you. Watch for another article coming soon when I add on the new Shock Towers! Workability 8/10 You can get to most of your ride, but there will be time when it gets tough. Car Show Rating 10/10 Ka-bling! Wow, what a eye catcher cage and skids are! 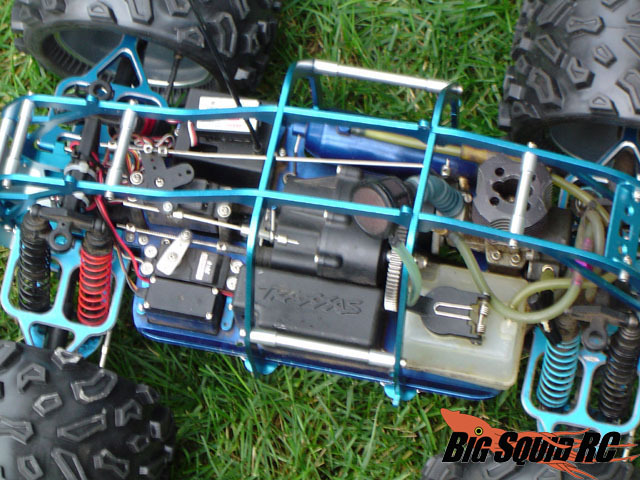 Bash-A-Bility 10/10 No chance of damage inside the cage, and the skids are super! 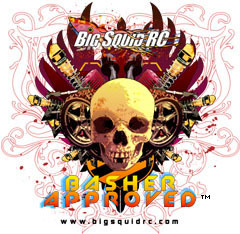 Big Squid Rating 9.2/10 Tentacles. Looks great, and protects great! Adds some weight up top, and can add a little time to repairs, but well worth it.